G. Thomas Tanselle. 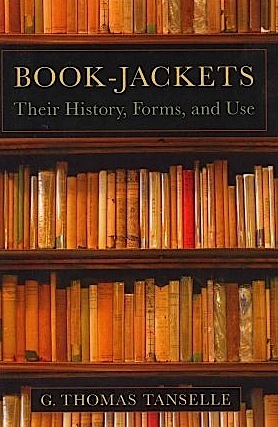 Book Jackets, their history, forms and use. Oak Knoll, 2nd edition 2011. £45. How many academic books sell out in months? This one did. Around a year ago I ordered a copy of the first edition and the publishers told me that they had sent it. I never received the book and was later sent a second edition. Perhaps some book collecting postal worker took the first to be sent. If any work in the field of bibliophily is likely to become a new ‘must have’ for collectors dealers and auction cataloguers alike, this is it. For one thing, it’s a labour of love by arguably the world’s greatest authority on book jacket history. Secondly, it is based on the author’s own collection, which was begun in 1968, and is soon to be lodged in an American library. This catalogue is supplemented by Tanselle’s decades-long correspondence with fellow enthusiasts in the field, notably Tom Congleton, who used to write a column for Rare Book Review. Thirdly, the book has the distinct appeal of cutting edge research, albeit in a subject that for many non-bibliomaniacs, has always been regarded as the source of loud belly laughs. Forget all that. Book jackets are no longer a joke. To laugh at book jacket is to pass up the opportunity to make big money. There are many examples of a jacket being worth more than the book without it. For instance, a first edition of The Great Gadsby with the jacket will sell for many times more than a copy without one. In 1999 a copy of The Hound of the Baskervilles in a jacket made £80,700 at auction. A copy of Kipling’s Just So Stories (1902) in its dull brown jacket made £2,600 at Sotheby’s in 1986, the cataloguer noting that the ’ book on its own ‘ would sell for about £100. But why do so many collectors insist on a jacket ? Simple. 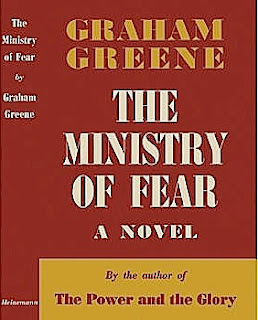 If the history of book jackets can now be traced back to around 1830, as Tanselle argues, surely it is not too much to ask that a book printed in, say 1930, retain its jacket and to be worth more by having it, especially as the jacket may contain important information not available in the book itself, such as reviews in obscure magazines, illustrations, and remarkably, extra material on the reverse surface of the jacket. And although most early jackets were dull brown paper affairs that simply reproduced elements of the title page in black ink, a jacket, however uninspiring, must be seen as part of the book. Does any collector of LPs throw away the sleeve notes on acquiring a new addition to his record library? But this new collecting trend brings with it new dangers. Tanselle warns us that modern technology has meant that laser- printed facsimiles can be passed off as the real thing by unscrupulous dealers. 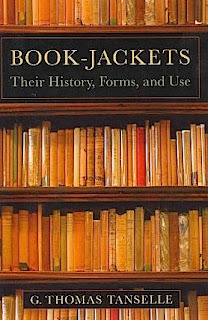 The old consolation that exceptionally rare modern books can’t be copied convincingly probably still applies, even in the age of the computer printer, but jackets are a different matter. With four figures sums at stake collectors must now be very vigilant. Half of Tanselle’s treatise is taken up with such matters, including, of course the history of the jacket, which we learn was a natural development from the first protective devices for fragile books, which were slip cases made of card. The first example listed dates from 1779, but doubtless others will be discovered sooner rather than later. After all, this is cutting edge stuff. Tanselle is good too on the rationale of the book jacket in the twentieth century and he rehearses all the silly reasons proffered by librarians and so called ‘ book-lovers’ for dispensing with them at the earliest opportunity. This is all very illuminating , but the meat of the book resides in its second half, which is a chronological list of jackets up to the end of 1900. Why 1900 ? For Tanselle this seems a reasonable cut-off date. By 1900 the number of jacketed books listed has crept from 2 in 1871 to over 137 in the year 1900. And anyway, have some finishing point has to be laid down, however arbitrary. Why do incunabula end in 1499 ? For collectors of book jackets Tanselle’s list is a ‘ wants list ‘, especially to American collectors. Those titles included in it are around 80% American imprints, because, after all, Tanselle is an American who lives and works and buys books in the States. However, the power of the Internet has enabled him to correspond with collectors and dealers all over the world , with the result that many British and a sprinkling of exceptionally early European jackets/slip cases, are also included. Many of the British books they cover seem to be illustrated editions of classics or verse, with Andrew Lang and Kate Greenaway featuring frequently. Others are rather dull or obscure books for which no sane person would think of shelling out three figure sums if it wasn’t for the jackets that come with them. Fab stuff Robin - Happy New Year to you and Nigel and to all fellow readers of this great blog. You mention the TLS - in the current issue James Campbell singles out Any Amount of Books as his favorite secondhand bookshop - 'cannot be beaten'. Incunabula do not end in 1499, but in 1500. The fifteenth century ran from 1401 to 1500. Dear Bookride, I'm reading your posts with a lot of pleasure. I find it bright and interesting! I have a blog about book collecting too, in italian and english (my mother tongue is italian, so in the english version you may find some mistakes): www.artandbibliophilia.blogspot.it. It talks about the relationship between art and book collecting, sometimes only about the first or the second. It's good to find a blog similar to mine! Michael Femelon is wrong. The fifteenth century ran from 1400 to 1499. Keep up the good work Bookride. Most people consider a century to start 01 and end 00 - see Wiki, the fount of all knowledge. Love the idea of a postal worker somewhere, on the hunt for rare first editions; he would be in the right job for that. Sort of surreal. With a massive hoard stashed back at home, Brighton Rock d/j's and all. It talks about the relationship between art and book collecting, sometimes only about the first or the second. It's good to find a blog similar to mine!